Starting July 5th, Hornblower Cruises & Events will offer passengers amazing viewing opportunities of San Diego’s most fascinating natural phenomena, the Blue Whale Migration. Imagine the excitement of seeing a 100 ft. long blue whale, the world’s largest mammal, emerge from the water just a short distance away while enjoying the safety and comfort of Adventure, Hornblower’s stable and spacious yacht. With thousands of blue whales, finback whales (world’s second largest whale) and humpback whales expected to feed off San Diego’s coast this summer, accompanied by the usual assortment of sea lions and several species of dolphin,Hornblower’s Blue Whale Watching Adventurepromises to offer passengers the #1 thing to do in San Diego, a once-in-a-lifetime whale watching trip. Interaction with Trained Docents from the Nat (San Diego Natural History Museum): To make Hornblower’s Blue Whale Watching cruise truly educational, volunteer naturalists from theNat provide ongoing commentary for spotting spouts, flukes, and massive whale tails, as well as information about the blue whale habitat and blue whale facts. 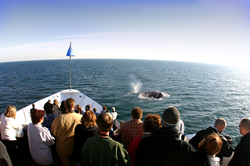 In addition, captains are experts at finding the best whale watching spots for shooting the best blue whale pictures. A Comfortable (and Dry) Experience: Unlike traditional small boat whale watching trips (where foul weather gear is a necessary accessory), Hornblower provides the ability to view these beautiful creatures from the Adventure, a fully appointed, 150 ft., ocean-ready yacht. Under the direction of its experienced captains and crew, the Adventure provides unparalleled stability as it glides through the ocean waves. With a top-level outdoor sundeck 30 ft. above the water and two climate-controlled indoor levels, the Adventure ensures optimal comfort and panoramic views for San Diego whale watching and San Diego sightseeing for everyone. Food Service and Full Bar: Passengers can purchase delicious snacks, complimented by a full bar service. Dates & Times: Hornblower Cruises & Events’ Blue Whale Watching Adventure provides San Diego day trips every Saturday and Sunday from July 5 to August 31. Passengers board at 8:45am and sail from 9:00am to 1:00pm. Tickets: Costs are $75 for adults, $40 for children ages 3 to 12 and $73 for seniors. Children under three are free. Discounts for groups of 20 or more, the military, and season passes are available. To make reservations, visithttp://www.hornblower.com/port/overview/sd+bluewhalewatching.